If you have been on Twitter in the last couple hours, chances are you've probably seen a lot of news and speculation regarding BEA as well as the distribution of advance reading copies. A lot of people are having a lot of feelings about this on Twitter, but that really isn't my forte so I'm going to be sharing my thoughts here. Starting in 2017, in an attempt to "bring the show back to its core," the number of "non-professionals" allowed to attend will be cut down to 6,000 total. 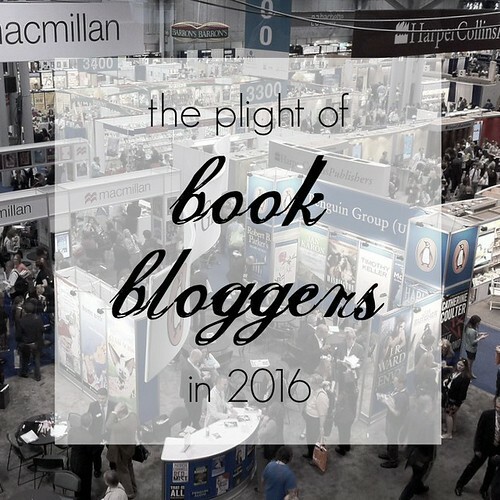 That's 6,000 total non-professional book lovers, including bloggers, who will be able to attend from around the world. The application process will be more rigorous and, although they didn't specify what that process will entail, I'm going to assume the blogs that will be represented will be those with very large followings. The second issue that has come up is advance copy distribution. There is no real source to link to for this bit of speculation, but it has been traveling around Twitter secondhand. 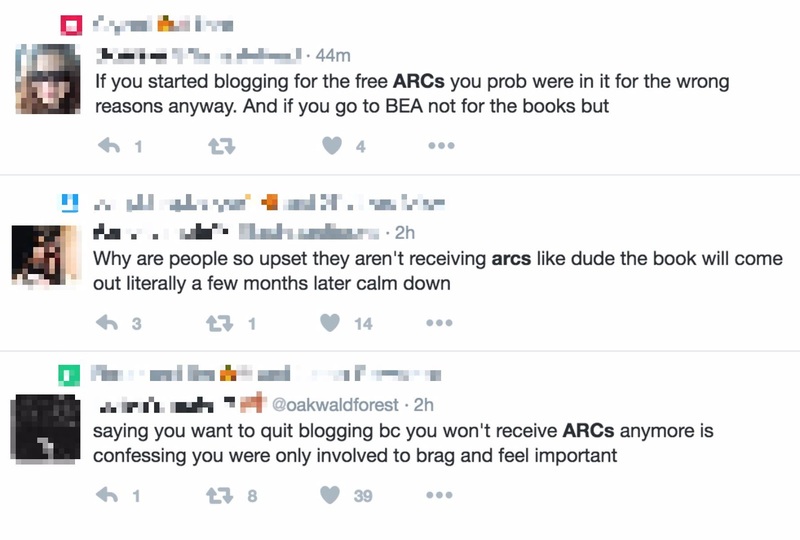 Supposedly a book blogger who has received ARCs from HarperCollins in the past has been told that bloggers will no longer be receiving them. Instead, they will be reserved for BookTubers and Bookstagrammers. The truth of these claims is not necessarily the issue. The real problem is how people have reacted. Obviously I cannot speak for other bloggers, but please let me try to explain why these tweets are missing the point, in my opinion. Two and a half years (and a few blog overhauls) later I know what an ARC is, although I don't get them from publishers, and I've been to ALA once. The only ARCs I've gotten have been from the one event I attended, volunteering at my local library, and trading. All that to say I do NOT blog to get free books. I buy way too many books, actually. I buy books instead of clothes, makeup, or shoes (seriously, I wear flip flops, rain or shine). The reason that this is upsetting is not because I'm mad I won't get free ARCs. The reason this is upsetting is because I (and several others I've spoken to) suddenly feel as if we are completely disposable to the people we spend all our free time promoting and fangirling over. I have put years of work and devotion into this blog (and others have spent much, much longer blogging than I have) and I had liked to think that, even without ten thousand followers, I was making some kind of a difference to the authors and publishers I loved. As a blogger friend put it, "I don't blog for books but it was nice thinking that I was helping authors and publishers and they might notice and appreciate me someday." So no, I am not devastated that I won't be getting ARCs from the major publishers I already wasn't getting them from. But I am a little bit hurt to see that we bloggers matter less than we actually thought. Don't get me wrong, understand that publishers have to make money. I get that BookTube is potentially the next big thing, but it's still disheartening. Will I continue blogging? Of course I will. I'll continue getting ARCs from volunteering, trading, and ALA (for as long as they allow us to attend) and I'll continue spending way, way too much money filling up new bookshelves. I blog for the love of reading, not for free books. In the end though, it's always nice to feel like what you're doing makes a difference.